We have worked last 6 months on a big project for a sport TV channel. 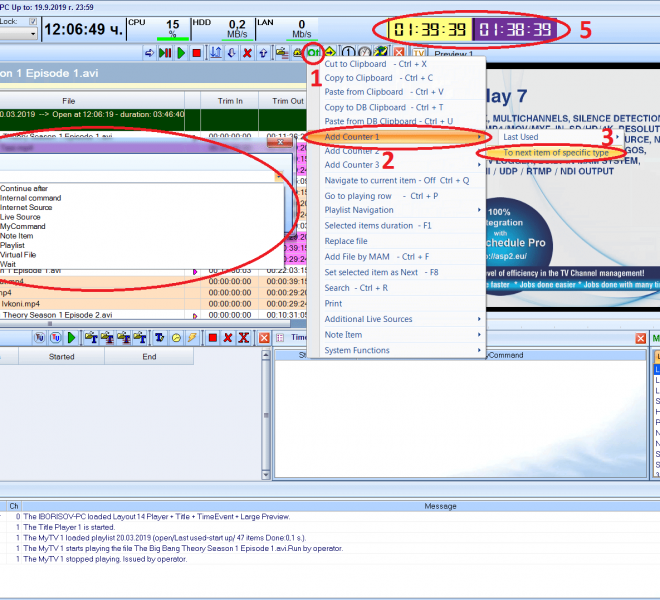 Most of the DV Play customers use primary schedule and playlists ready in advance, now we have updated our solution to be extremely useful for a dynamic TV too. 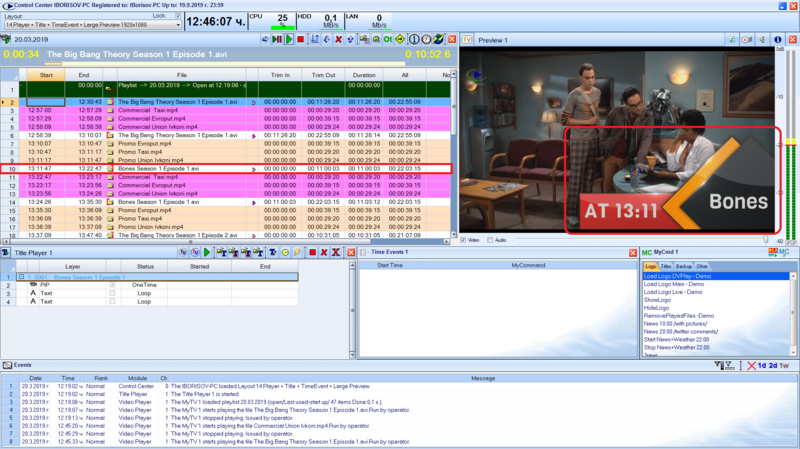 A dynamic TV means a TV which requires a lot of manual works done directly into the video player, huge number of live events (sometimes 30 per days), planning a lot of virtual video files (files that are planned into a playlist, but not ready yet and which duration is not known /predicted/– typically a re-rerun of live event saved into a video file), extensive work with segments (Trim In/Out), etc. Video Player – huge improvements in the work with file segments. New columns for Trim In / Trim out / All Duration are added. Option to read segments provided via XML files are added as well. 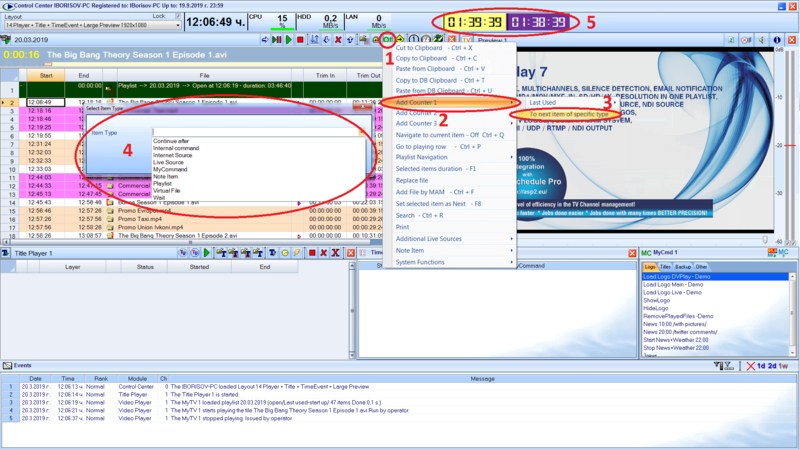 New options for DV Play original implementation for auto show of the Next event – now the exact time or the minutes left till Next event could be shown automatically. New Title Template for squeeze. Improved work with Titles for 4K resolution. Many improvements in the Redundancy mode /Master – Slave/. Huge improvements of the reliability. A real 24/7 mode is provided. Performance improvements & small fixings. Counters The Counters are designed to show the time left to the next Live event, to the next Note or missing file, etc. Up to 3 counters are available. Look on the screenshot how to turn on the Counters. The Counters are designed to show the time left to the next Live event, to the next Note or missing file, etc. Up to 3 counters are available. Look on the screenshot how to turn on the Counters. Run of graphic /Coming Next/ with time left. The time left to the next event is got directly automatically from the loaded playlist, whatever changes on the fly are done in the loaded playlist, the time left shown in the graphic will be accurate without any manual work required. Run of graphic /Coming Next/ with time left. The time left to the next event is got directly automatically from the loaded playlist, whatever changes on the fly are done in the loaded playlist, the time left shown in the graphic will be accurate without any manual work required. Run of graphic /Coming Next/ specifying the time. The specific time when the next event will be run is got directly automatically from the loaded playlist, whatever changes on the fly are done in the loaded playlist, the remaining time shown in the graphic will be accurate without any manual work required. Run of graphic /Coming Next/ specifying the time. The specific time when the next event will be run is got directly automatically from the loaded playlist, whatever changes on the fly are done in the loaded playlist, the remaining time shown in the graphic will be accurate without any manual work required. Trim In / Trim out / All Duration columns Extensive work with segments requires a good view over the selected Trim In / Trim out part of the file. The columns shown on the screenshot could be turned on now when they are required. Extensive work with segments requires a good view over the selected Trim In / Trim out part of the file. The columns shown on the screenshot could be turned on now when they are required. Squeeze example A demo title with squeeze example ready to use is set in MyCommand module – Logo Tab - Squeeze command. Its execution is shown on the screenshot. A demo title with squeeze example ready to use is set in MyCommand module – Logo Tab - Squeeze command. Its execution is shown on the screenshot.